Credit: X-ray: NASA/CXC/ESO/P.Rosati et al. ; Optical: ESO/VLT/P.Rosati et al. 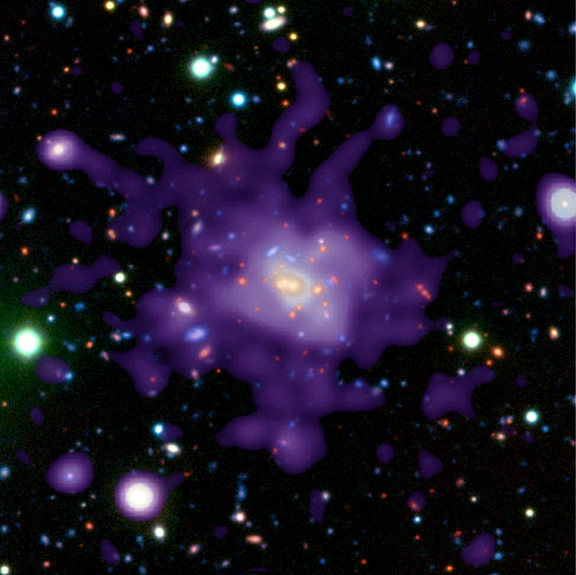 A color composite image of the galaxy cluster RDCS 1252.9-2927 shows the X-ray (purple) light from 70-million-degree Celsius gas in the cluster, and the optical (red, yellow and green) light from the galaxies in the cluster. X-ray data from Chandra and the XMM-Newton Observatory show that this cluster was fully formed more than 8 billion years ago, and has a mass at least 200 trillion times that of the Sun. At a distance of 8.5 billion light years, it is the most massive cluster ever observed at such an early stage in the evolution of the universe. 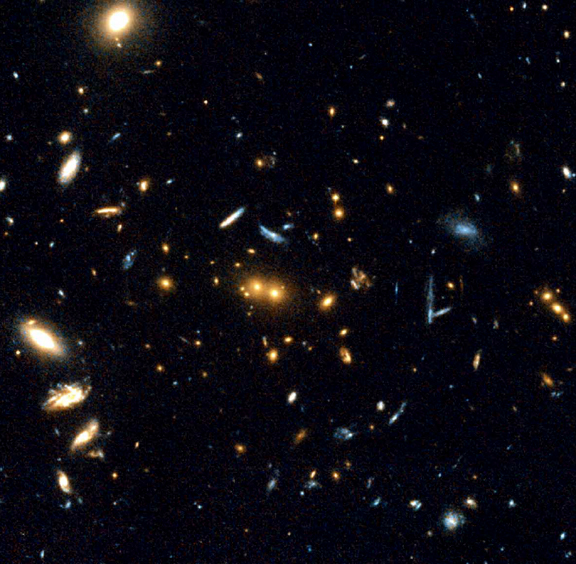 Even though the cluster is seen as it was only 5 billion years after the Big Bang, it has an abundance of elements such as silicon, sulfur, and iron similar to that of clusters observed at more recent epochs. The cluster gas must have been enriched by heavy elements synthesized in stars and ultimately ejected from the galaxies. The relative abundances of these heavy elements are indicators of the star formation history of the galaxies. The observations of RDCS 1252.9-2927 are consistent with the theory that most of the heavy elements were produced by massive stars some 11 billion years ago. The large mass of the cluster is also significant. The currently favored theory for the formation of clusters is that they are formed from the merger of many sub-clusters in a universe dominated by cold dark matter - hypothetical subatomic particles left over from the dense early universe. Cold dark matter gets its name from the assumption that these dark matter particles were moving slowly when galaxies and galaxy clusters began to form. Because the merging process takes time, there is a limit to how fast a cluster can grow and therefore how massive it can be at early epochs. The existence of one cluster as massive as RDCS 1252.9-2927 is consistent with the cold dark matter hypothesis, but the discovery of more such massive galaxy clusters would pose a serious challenge. A major test will come as astronomers search for evolutionary links between RDCS 1252.9-2927 and the recently discovered proto-clusters such as 4C41.17 and 3C294 that were forming 12 billion years ago. Credit X-ray: NASA/CXC/ESO/P.Rosati et al. ; Optical: ESO/VLT/P.Rosati et al. Scale Image is 2.0 arcmin across. Coordinates (J2000) RA 12h 52m 54.50s | Dec -29° 27' 18.00"
References P. Rosati, astro-ph/0309546 "Chandra and XMM-Newton Observations of RDCS1252.9-2927, A Massive Cluster at z=1.24." To appear in Jan 2004 Astrophys. J.